This month, the National Gallery of Victoria (NGV) opened its latest exhibition which showcases one of Italy’s most ancient and famous arts: Venetian glass. On display until April 12, 2020, ‘Liquid Light: 500 Years of Venetian Glass’ showcases the art from the 16th century up until modern times, focusing particularly on objects from the 1800s. Visitors can admire around 150 precious pieces, including goblets, vases, glasses and decorative objects. It’s a rare occasion for Melburnians, given that the last time Venetian glass was exhibited in Australia was in 1881, for the Melbourne International Exhibition, in which the NGV housed many of the objects on display. 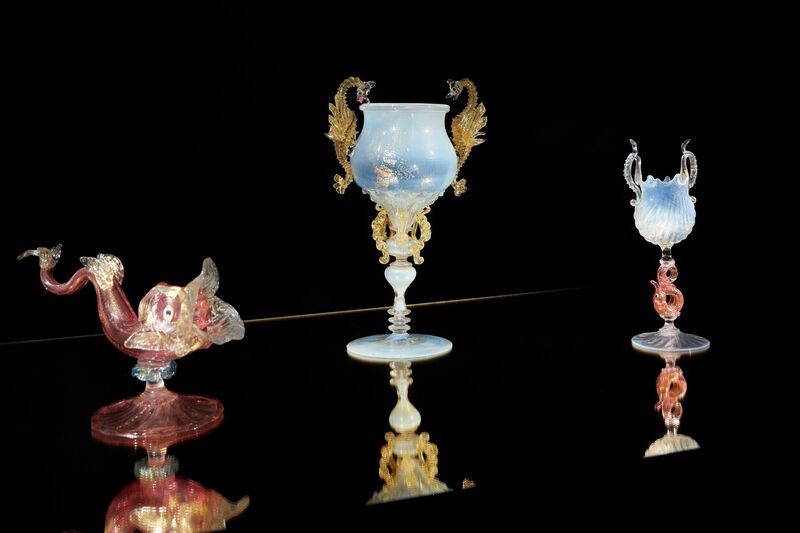 Venetian glass is an age-old practice, as the exhibition’s curator, Amanda Dunpol, explains. “On the island of Torcello, in the Venetian Lagoon, glass objects dating back to the eighth century have been discovered,” she says. Since ancient times, Venetians have worked tirelessly to find the perfect manufacturing formula to create a material which is as clear and pure as possible. In 1460, cristallo glass was invented by Angelo Barovier on the island of Murano, where the majority of Venetian glass was produced. While the rest of Europe still had glass with a yellow or greenish colour originating from iron oxide impurities, Murano was producing a material that was literally crystal-clear. “From that moment, Venetian glass experienced a golden age in Europe and in the Middle East, thanks to the geographic position of Venice,” Dunpol explains. The exhibition focuses on objects from the 19th century, made from cristallo, milk glass (an opaque or translucent, milk white or coloured glass), and filigree glass (which uses a centuries-old process to create colourful, bright patterns embedded into a glass shape), in what was considered an era of recovery for Venice and Murano, which suffered drastic cultural and commercial decline at the beginning of the century. The so-called period of decline of Murano glass is reflected in many of the objects and paintings that in turn reflect the tastes of Central Europe at the beginning of the 1800s and the spread of Bohemian pieces in the lagoon city. In the second half of the 19th century and during the era of the Venetian Republic, two new businesses – Fratelli Tosi and Salviati – aided the revival the Murano glass industry. They experienced commercial success abroad and new manufacturers began business, including that of Fratelli Barovier. Towards the 1890s, new and innovative movements began popping up across Europe, but the island of Murano kept producing 19th-century glass. In 1895, at the opening of the first Venice Biennale, the Barovier brothers produced extremely light goblets with spiral stems and a clear Art Nouveau shape. Then in 1921, Venini, the first furnace exclusively dedicated to the production of modern Murano designs, was opened. That event marked the beginning of a new era: the practice evolved from one of pure artisanal production into one of the production of design objects, resulting in collaborations between glassblowing masters and avant-guard designers. These pieces are now on display in Melbourne. The final part of the exhibition features Art Nouveau and post-World War II objects of pure artistic expression, made during a time when glassblowers were abandoning the production of ornamental objects and manifesting their interests in abstract forms, while still using traditional production techniques. Visitors can also enjoy the masterpieces of contemporary artists from the US who use Venetian techniques while taking their art in a different direction. This story appeared in the Thursday March 14, 2019 edition of Il Globo. On the island of Torcello, in the Venetian Lagoon, glass objects dating back to the eighth century have been discovered.